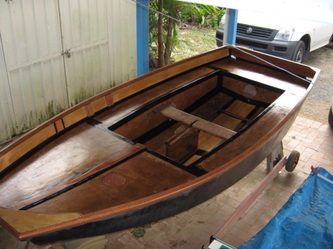 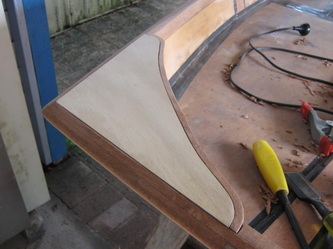 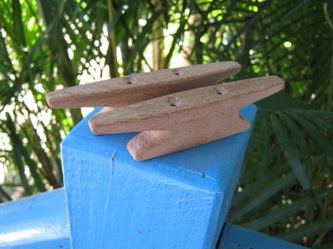 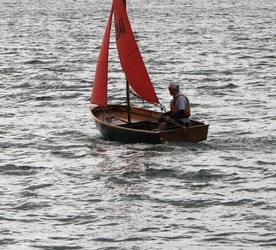 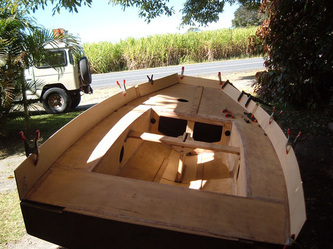 Wooden sailing boats are the penultimate in design and construction. 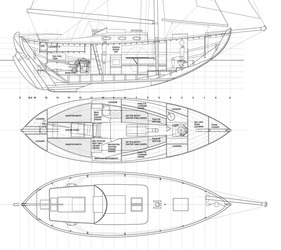 Just about every other design profession can find its apotheosis in this field. 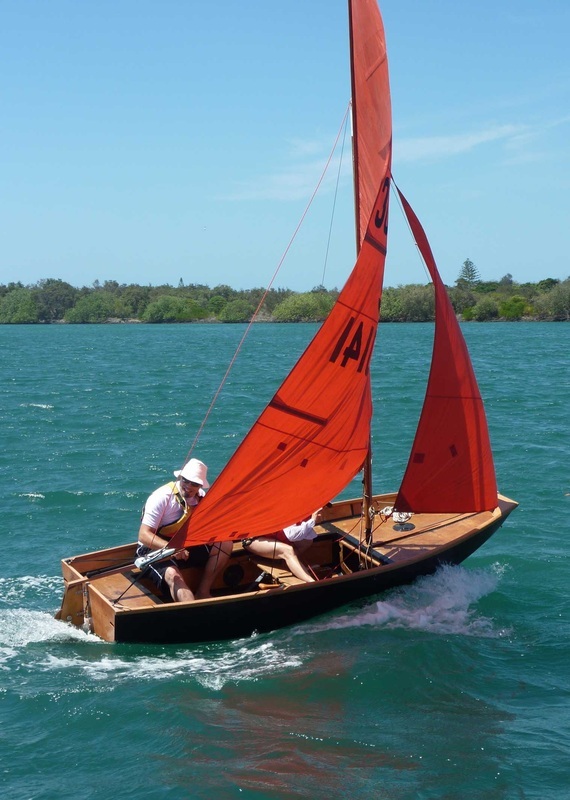 It is said that being involved in wooden sailing boats teaches you to be a mechanic, metallurgist, carpenter, joiner, cabinet maker, mathematician, painter, chemist and generalist problem solver. 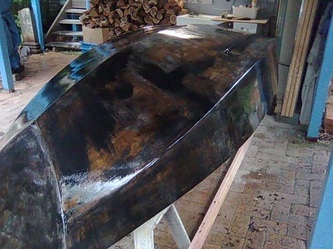 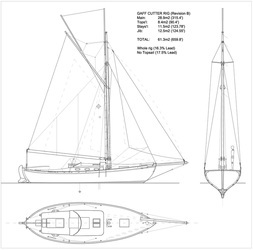 For this reason this page has been included as Duncan has found that working with and designing wooden sailing boats directly informs his work as a landscape architect. 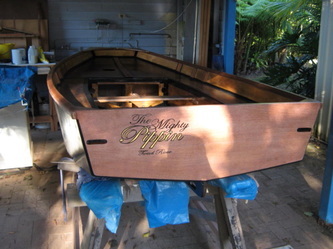 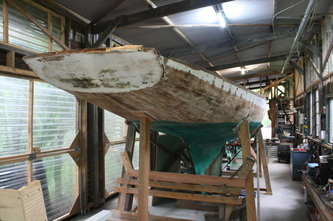 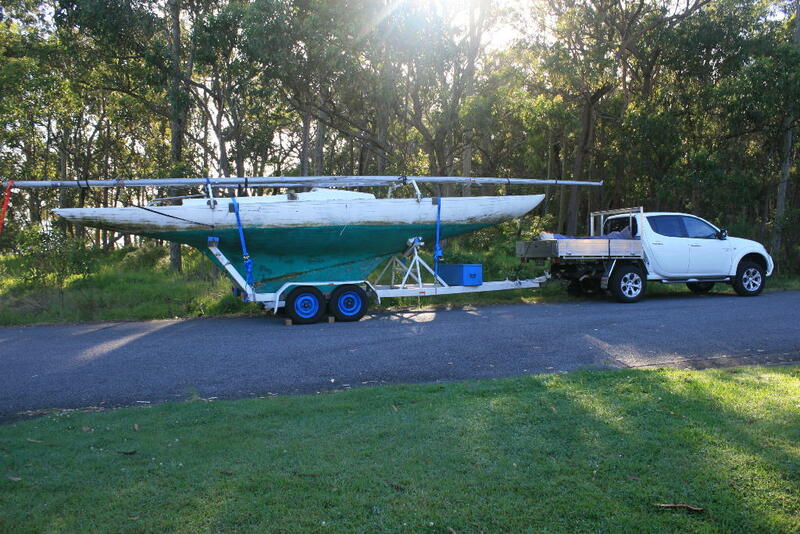 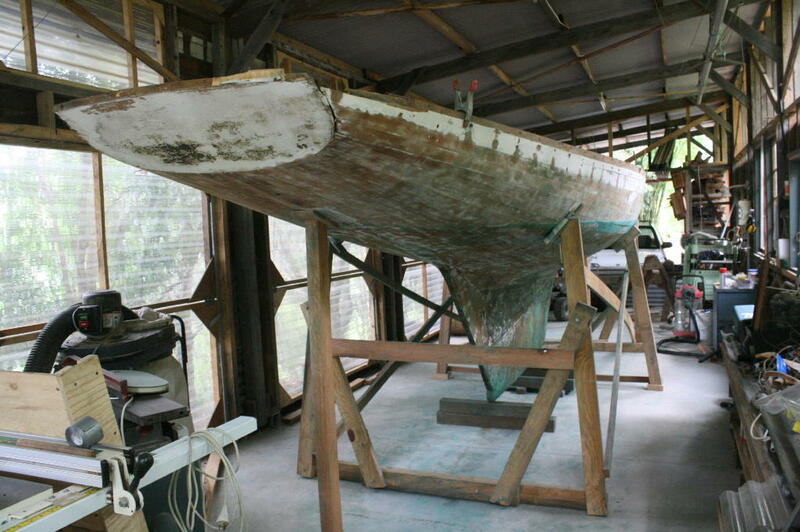 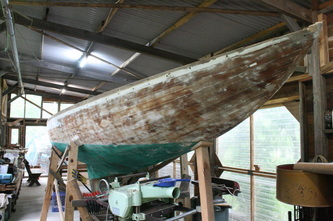 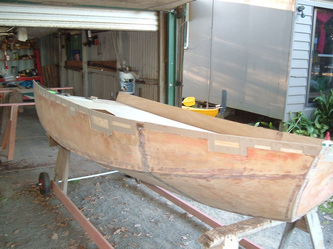 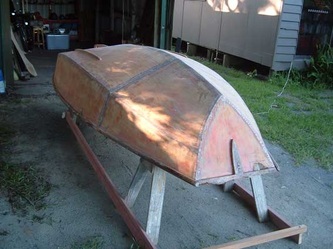 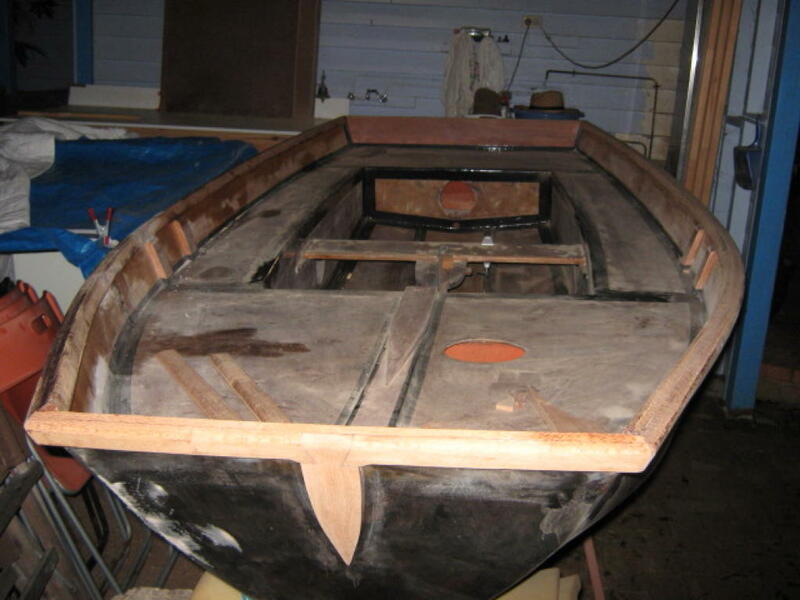 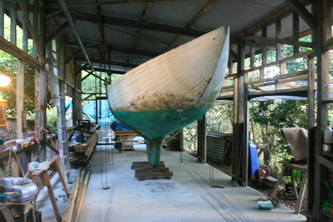 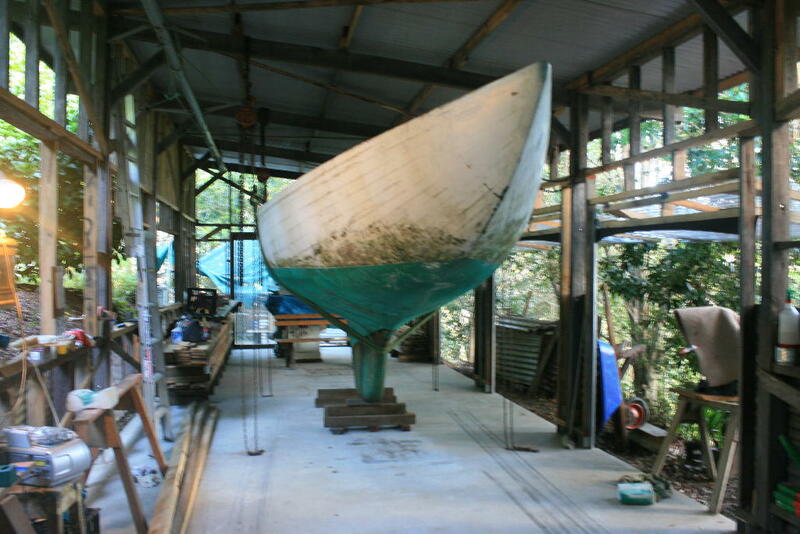 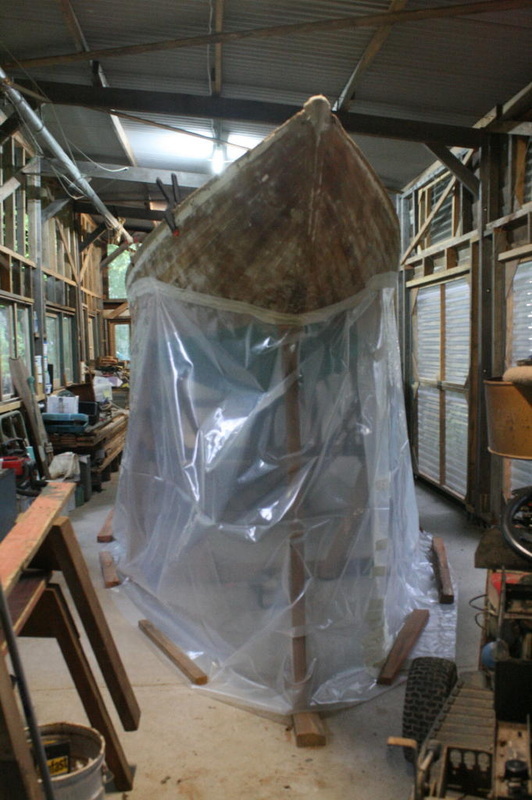 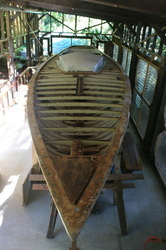 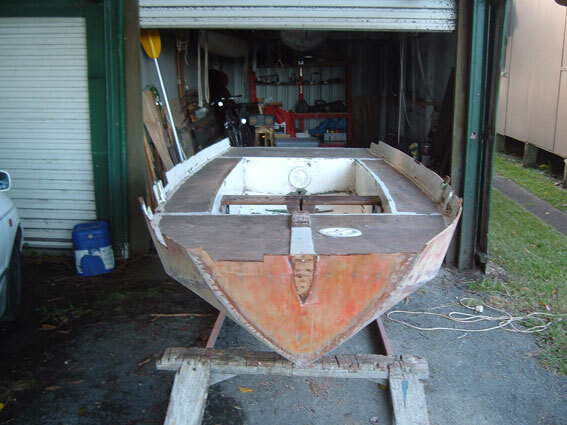 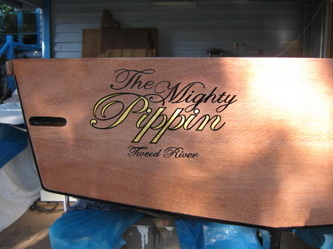 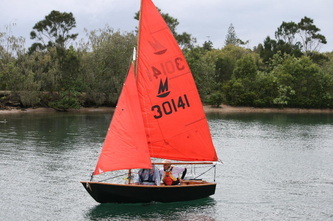 A continuing restoration of one of the original Pittwater Dragons built by Geoff Spring Brown and Alan and Alwyn Jarman in 1962. This will be her first major rebuild since she was launched. 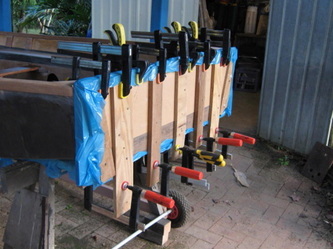 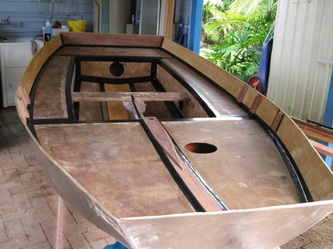 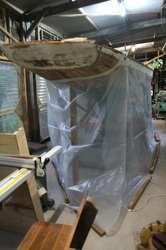 All her frames will be replaced with new Flooded Gum, epoxy laminated frames. 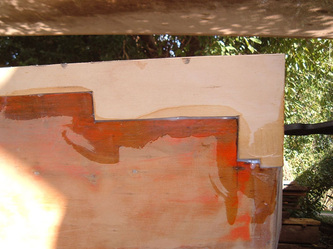 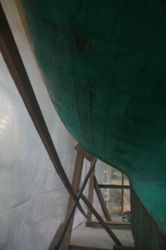 Oregon planking will be renewed around the sheer and the original tight seam carvel planks will be splined. 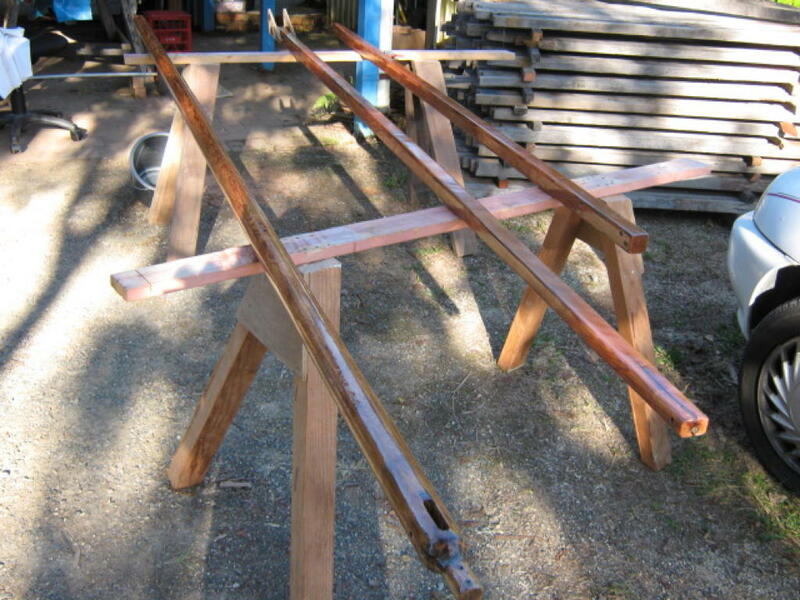 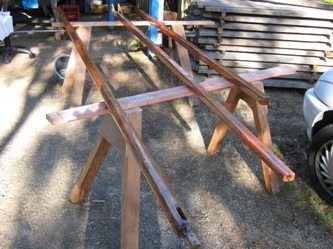 A number of deck beams will be replaced and the floors in way of the Iron keelbolts with White Mahogany (Eucalyptus acmenoides). 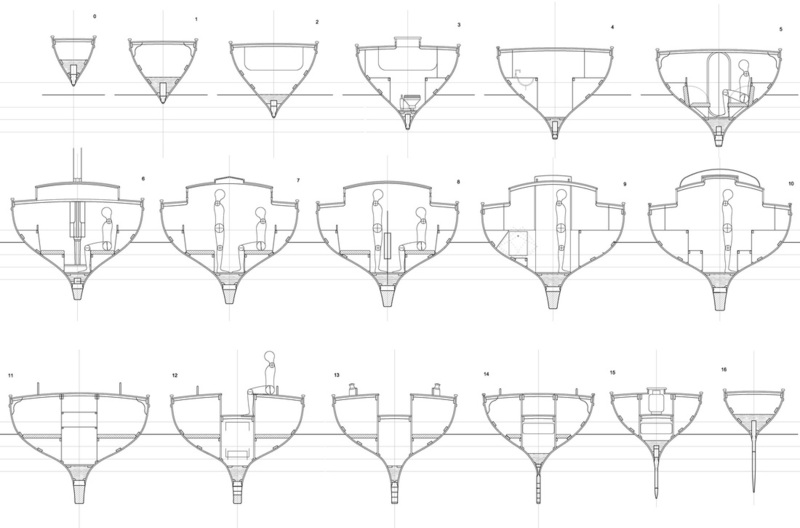 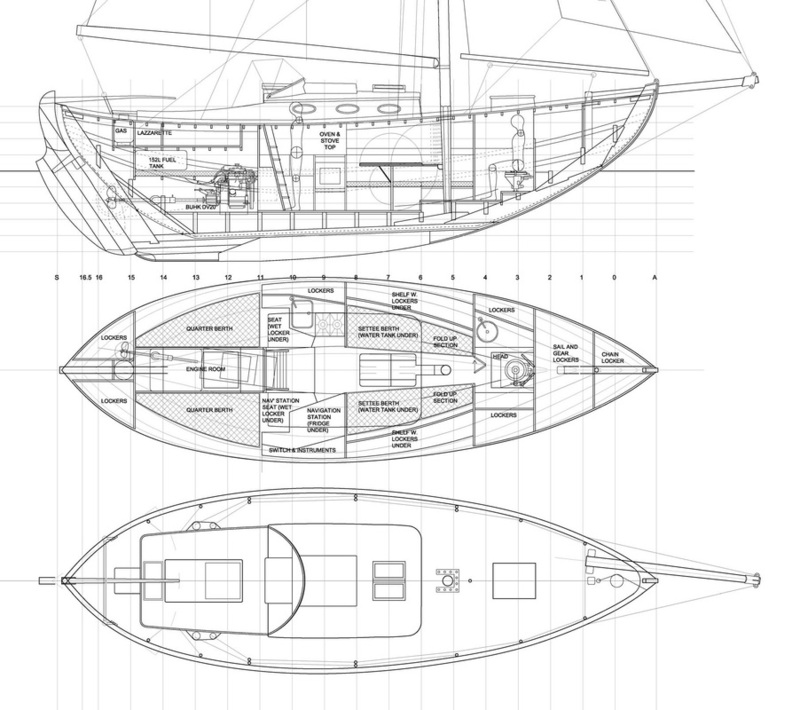 A new ply and glass deck will be finished in teak, and the open cuddy will be replaced with an enclosed cabin for camp cruising as per Johan Anker's original 1929 plans for the Dragon class. 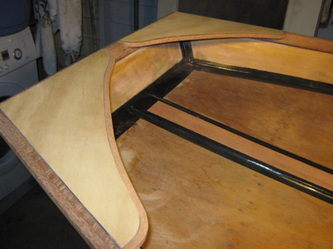 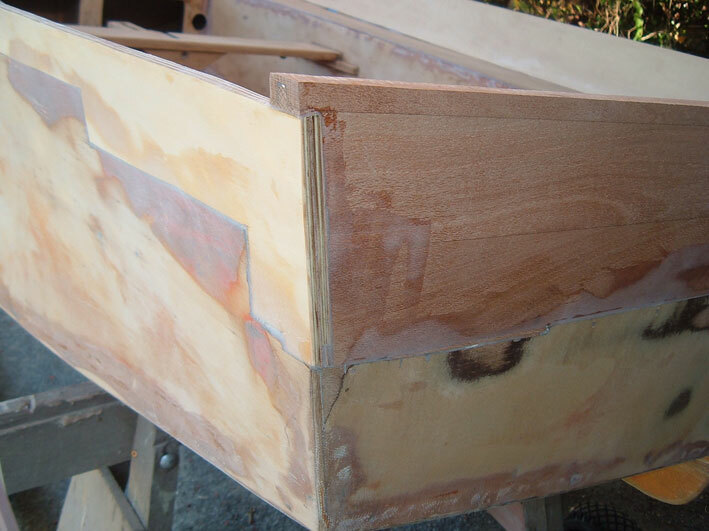 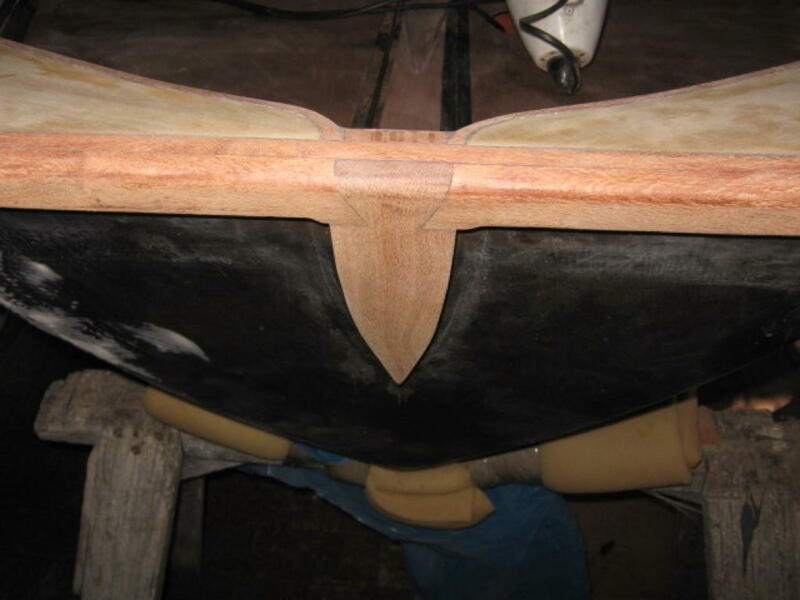 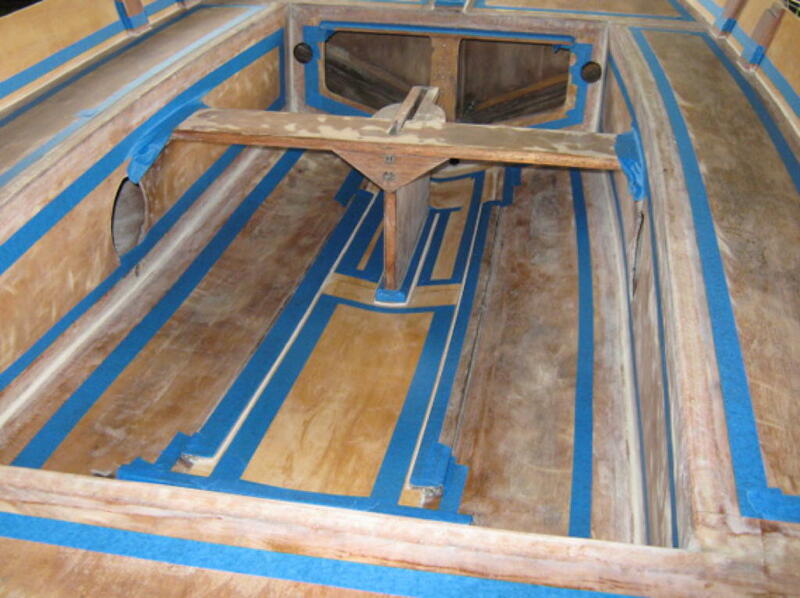 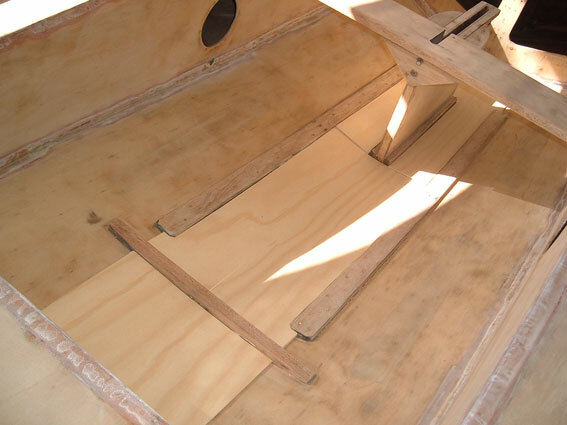 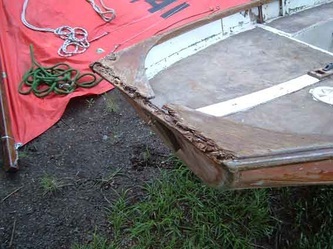 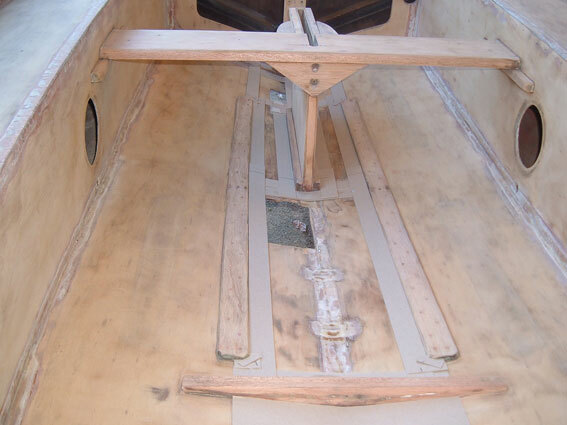 The long process of carefully removing the small timber plugs that cover the plank fastenings on the 1962 vintage, International Dragon Yacht Looe is done. 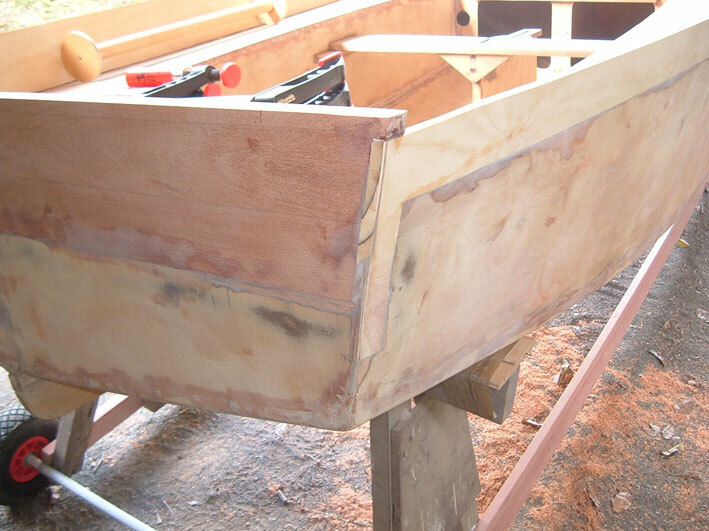 Each bung had to be precisely chiselled out in small pieces to avoid damaging the surrounding plank, or the screw under it, and present a clean hole for a new bung to be tapped back into place once all the frames have been removed and replaced. 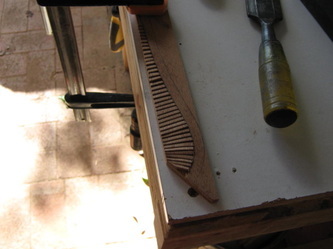 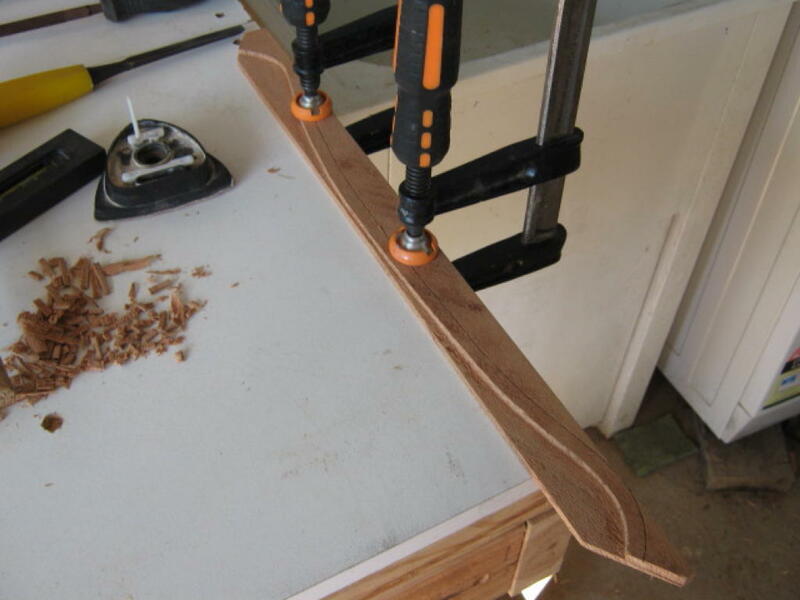 To this end each line of screws that fasten the planks to the frames must be removed as each frame is dealt with. 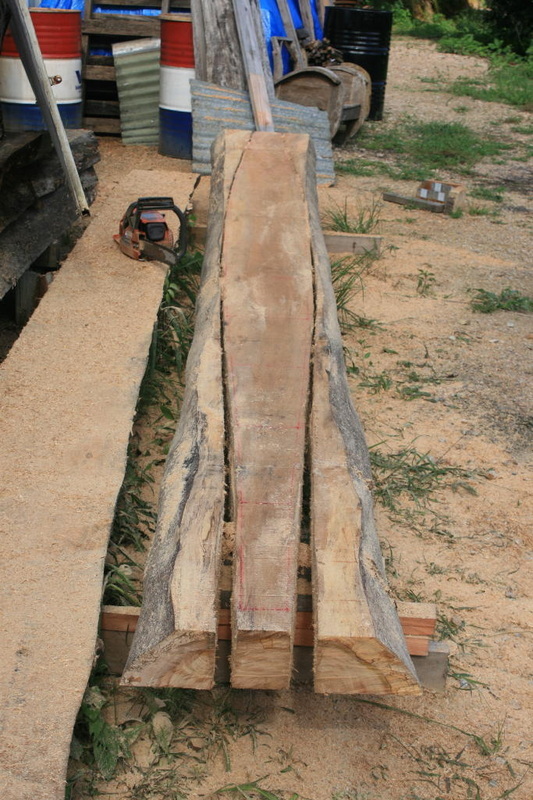 In all were are about 4000 bungs that had to be removed for access to the screws and for reframing to proceed quickly once underway. 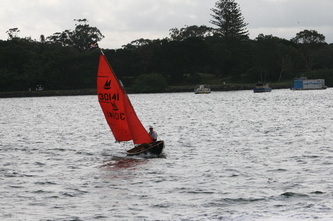 The music in the video was being played on ABC Classic FM at the time. 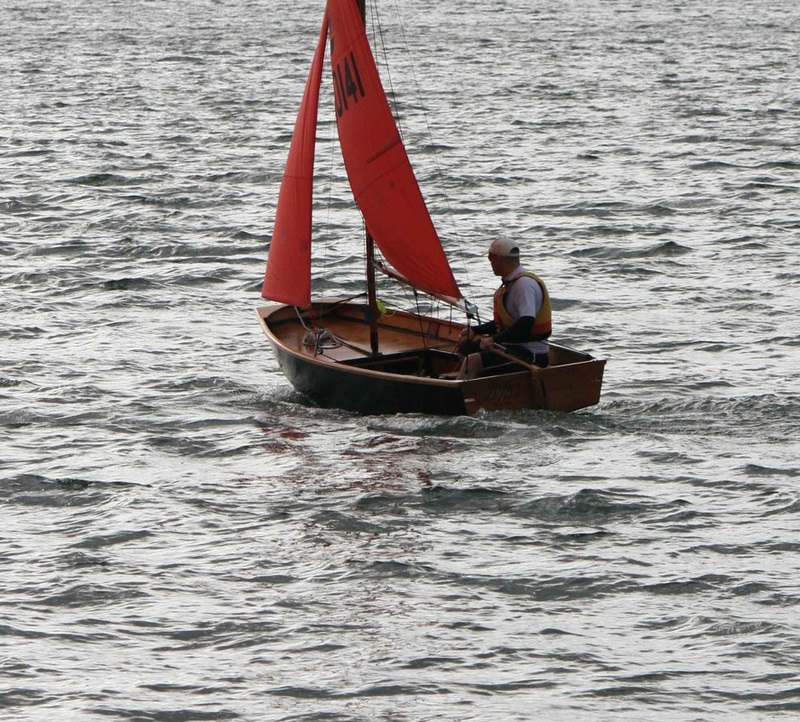 It's the Oboe Concerto by the late Australian composer Roger Smalley. The soloist is Joel Marangella with the West Australian Symphony Orchestra under the direction of the composer. 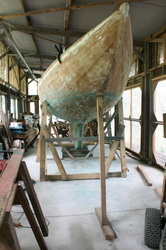 An enlargement of William Atkin's 1940s design 'Eric Jr' from 25 to 30 feet. 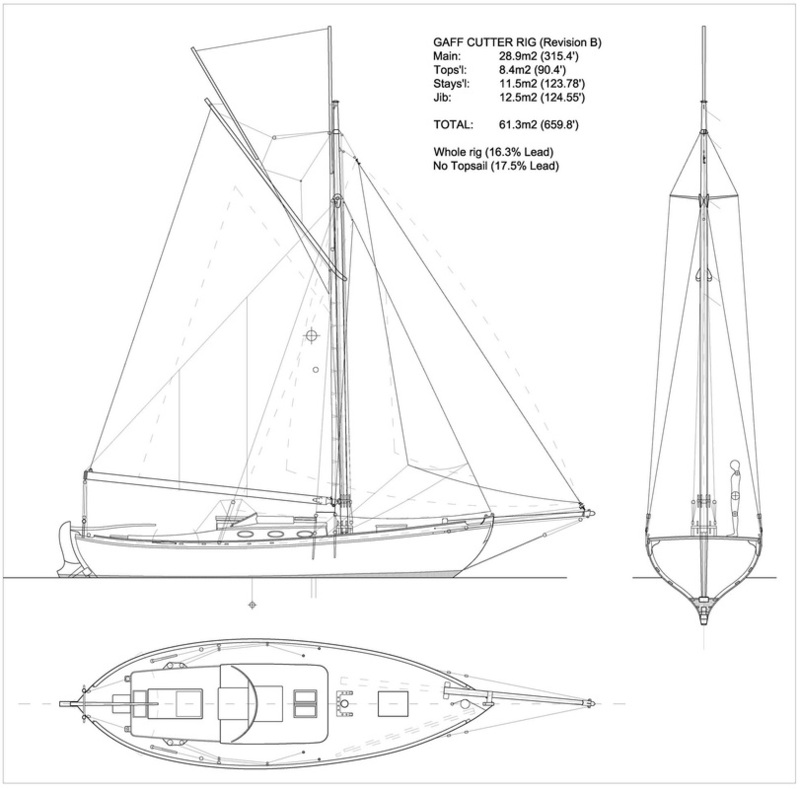 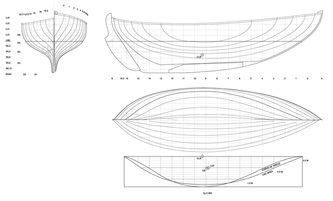 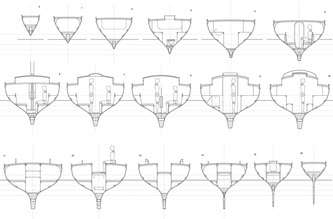 All the way subtle changes are made to improve the hull design, take account of the characteristics of the boat with careful parametric analysis and a change of rig from Bermudan sloop to gaff topsail cutter. 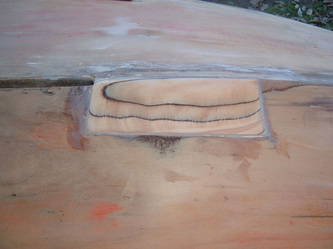 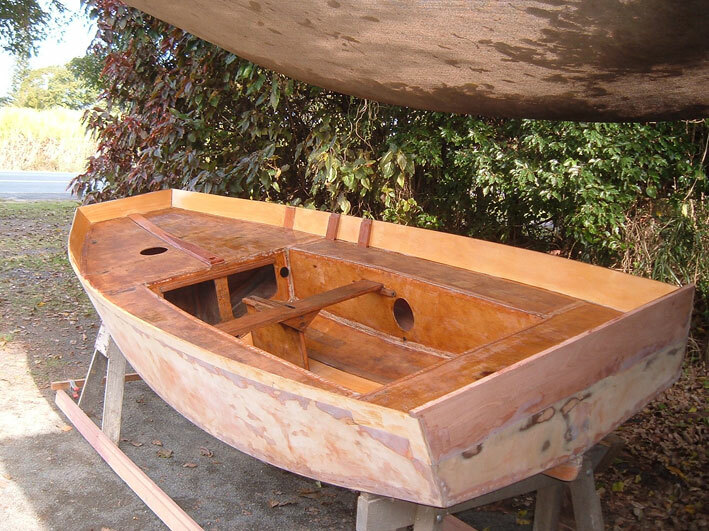 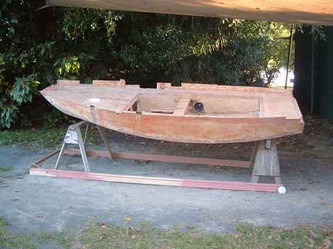 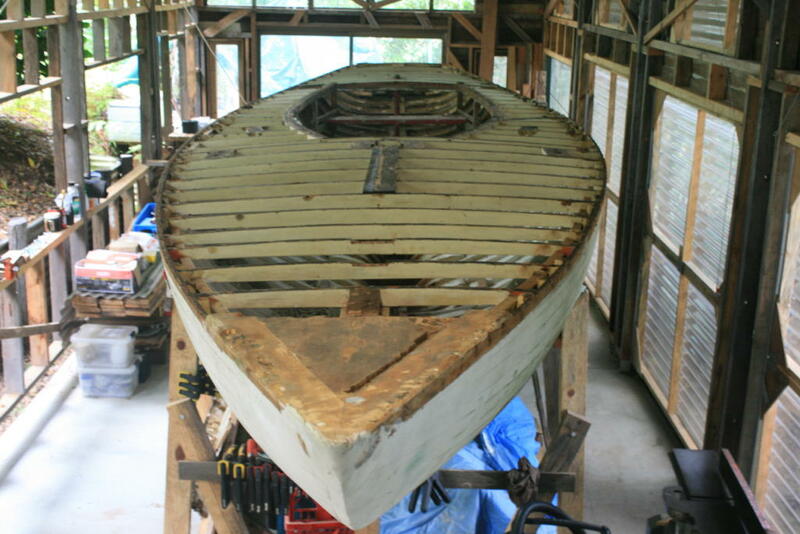 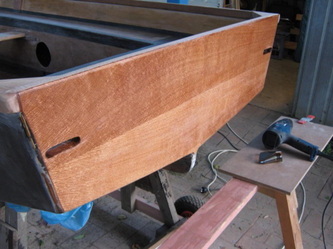 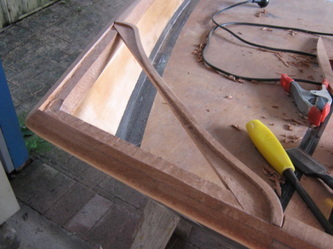 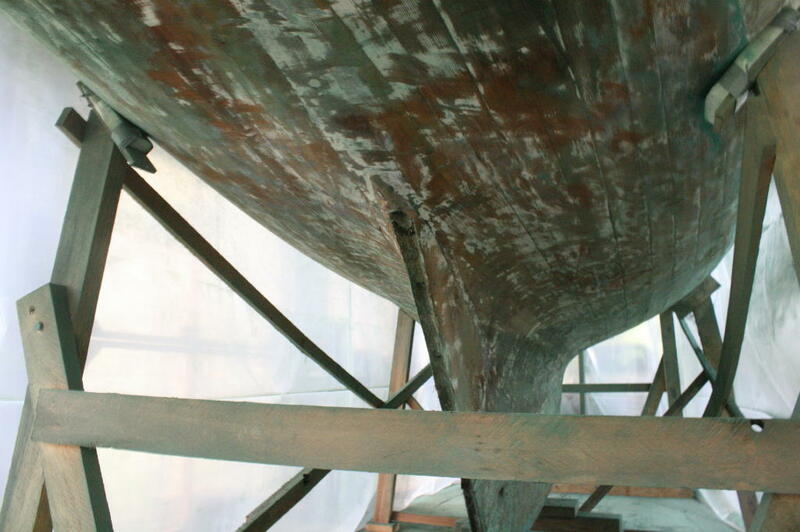 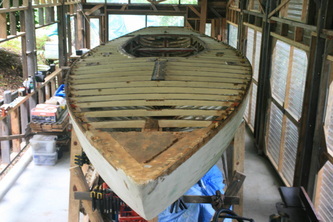 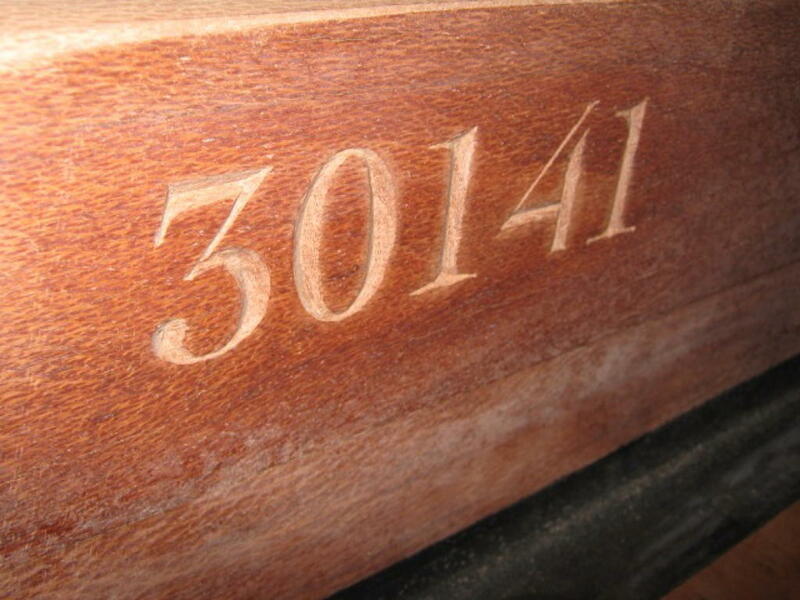 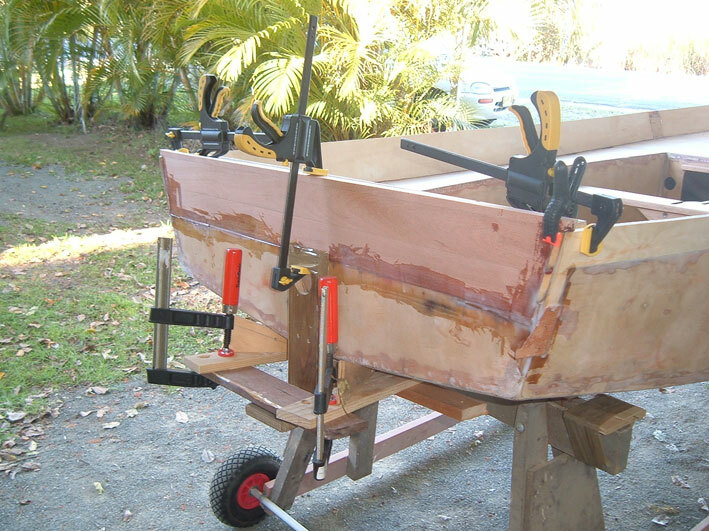 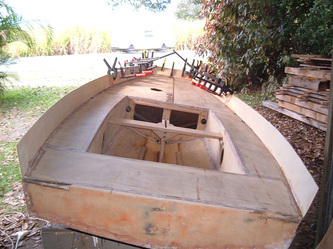 The keel has been cut and all of the other backbone and some of the planking timber is being seasoned. 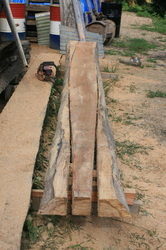 The New Zealand diagonal planking system, perfected by Arch Logan and Chas Bailey around the 1900s, is to be employed. 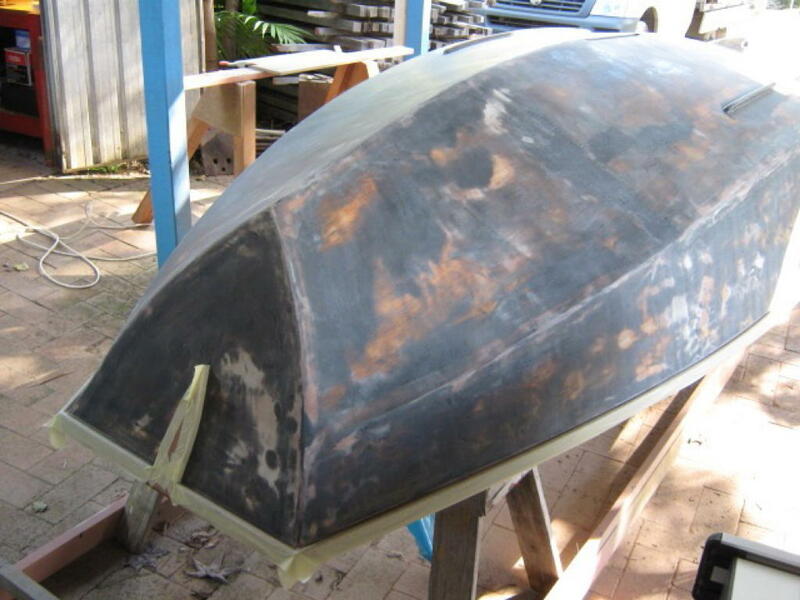 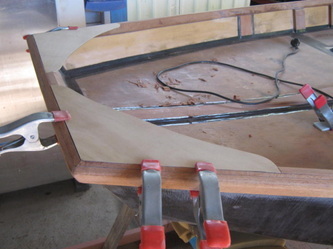 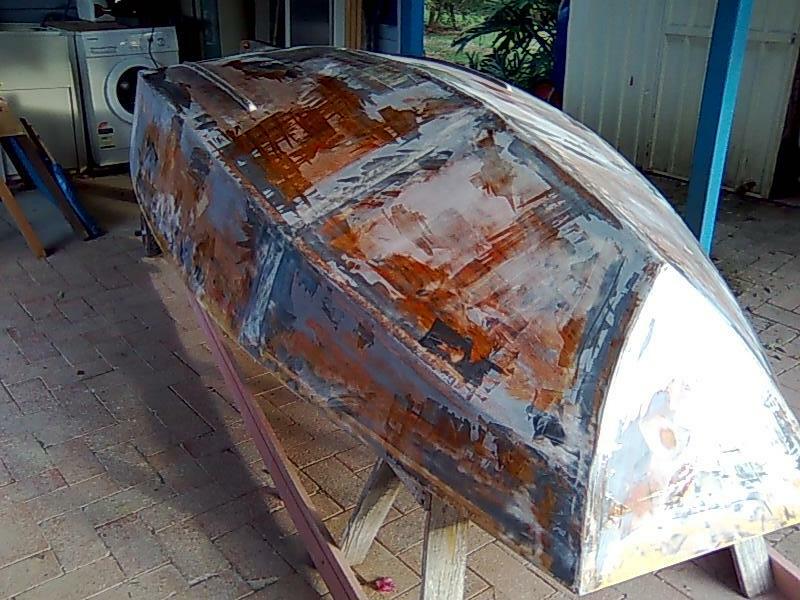 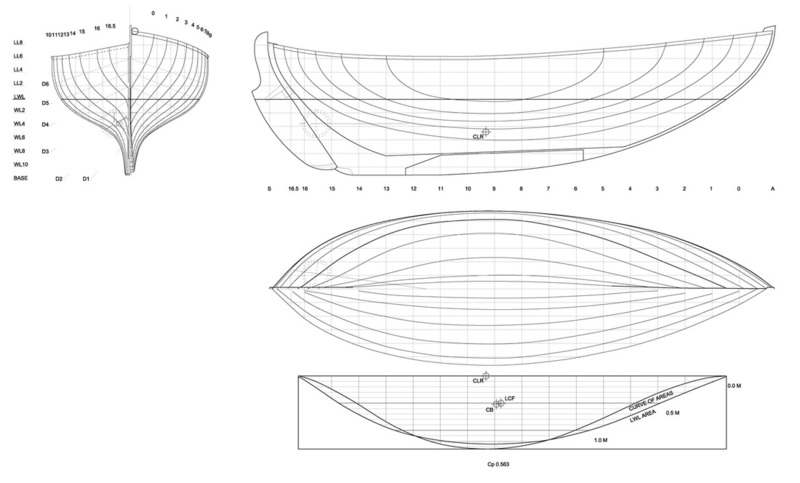 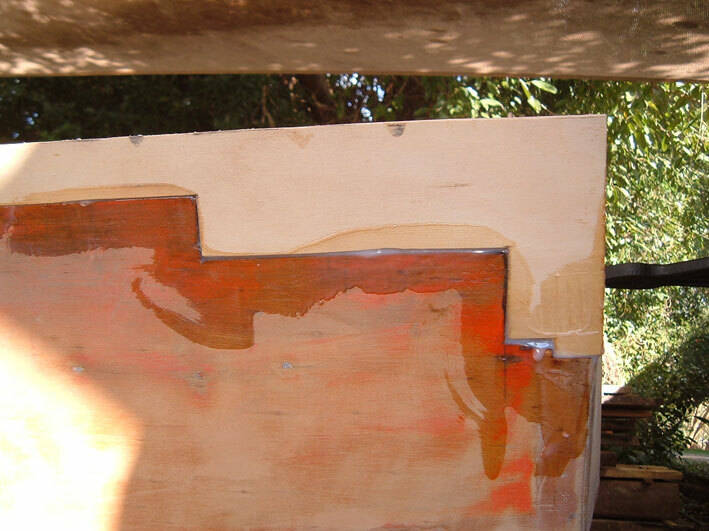 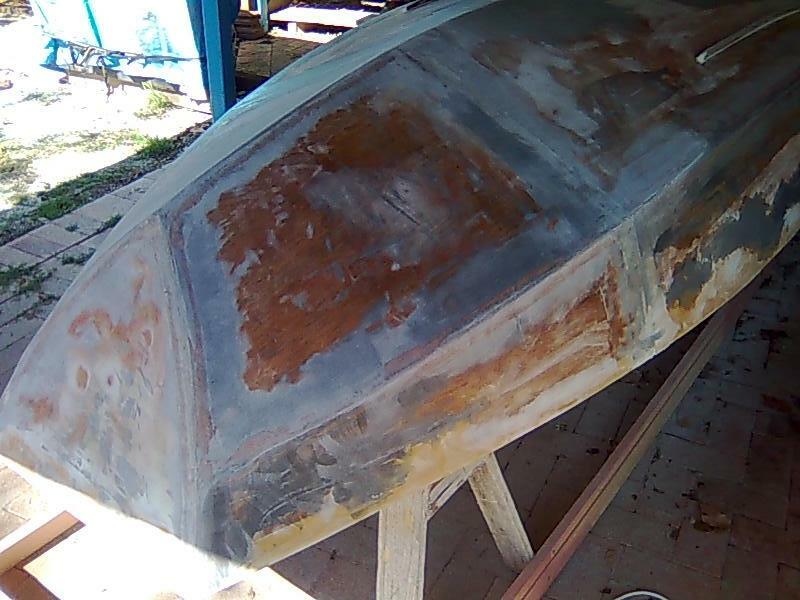 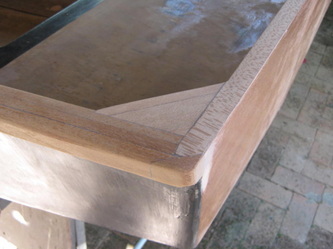 This will result in a strong monocoque hull, with a clean and mostly frameless interior. Thanks to Ed Burnett for significant advice along the way. 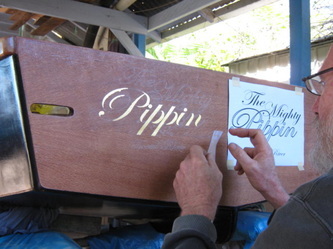 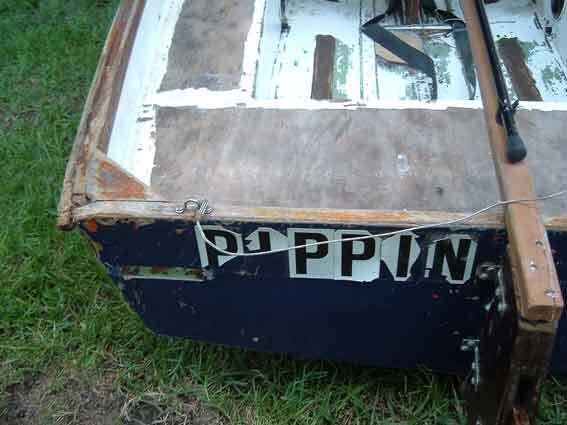 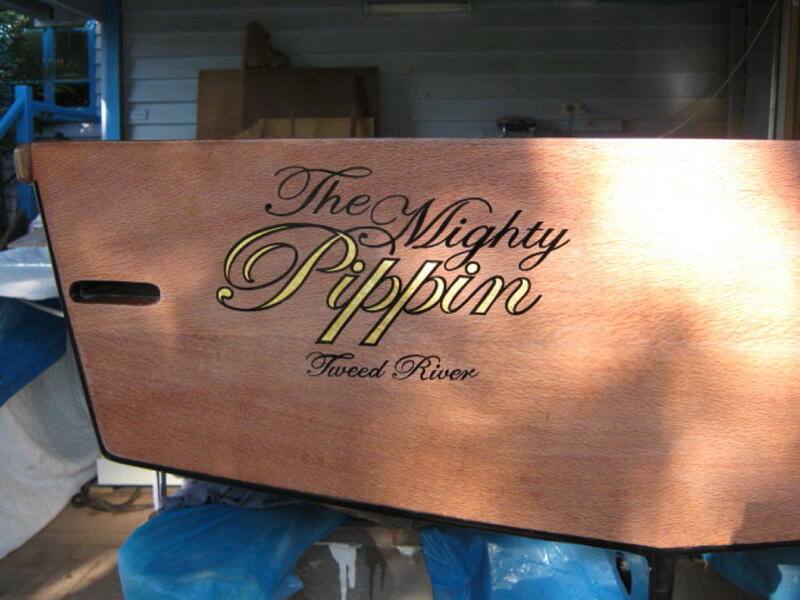 From plain 'Pippin' paddock ruin to restored and renewed glory as 'The Mighty Pippin' in 18 months, with a few bits of woodwork not normally found on Mirror dinghies.